A new study shows an experimental test may provide information that might stop eight cancers from metastasizing. In an attempt "to try to find cancer before it spreads, when chances of cure are best," many groups are working on "liquid biopsy tests that look for DNA and other things that tumors shed into blood," the Associated Press says. Findings of the study by Johns Hopkins University scientists, reported recently in the journal Science, indicate that the non-invasive tests were able to locate some 70 percent of the common types of cancer in 1,005 patients. "The rates varied depending on the type," the AP dispatch by Marilynn Marchione says, "lower for breast tumors but high for ovarian, liver and pancreatic ones." The CancerSEEK test, which "detects mutations in 16 genes tied to the cancer and measures eight proteins that often are elevated when cancer is present," the story continues, also honed in on colon, lung, stomach and esophageal cancers. Researchers did not include prostate cancer because the PSA blood test already is widely used — though its value for screening has been questioned. The eight cancers currently have no screening tests for people at average risk. According to Nickolas Papadopoulos, Ph.D. professor of oncology and pathology at Hopkins and one of the study's leaders, "We're very, very excited and see this as a first step." However, he cautions, "we don't want people calling up" and asking for it. That's because the new test "is nowhere near ready for use yet," the AP notes — "it needs to be validated in a larger study already underway in a general population, rather than cancer patients, to see if it truly works and helps save lives." The Los Angeles Times also quoted Papadopoulos, to the effect that "the goal is to look for as many cancer types as possible in one test, and to identify cancer as early as possible. 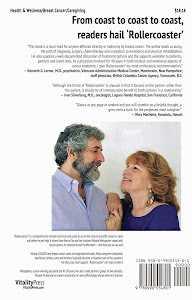 We know from the data that when you find cancer early, it is easier to kill it by surgery or chemotherapy." Researchers say the test could cost around $500 based on current materials and methods. 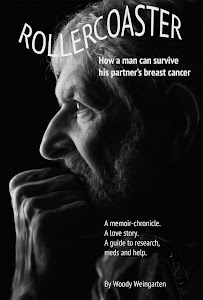 More information on research and clinical trials can be found in "Rollercoaster: How a man can survive his partner's breast cancer," a VitalityPress book I, Woody Weingarten, aimed at male caregivers.